It was one of the most shocking and horrible acts of cruelty we have ever seen. This young cat was brutally stabbed. It took 24 stitches to close his wound. Someone picked him up by the scruff of his neck and thrust the knife into his body. Or, this affectionate cat was waiting for a belly rub when the unsuspecting attack occurred. Even as he lay dying and in excruciating pain, Ernie's sweet nature came through. He purred with all his heart. The demented act of one person would not keep him from placing all his trust in people who care. Ernie was rushed to surgery. The gurgling sound from his chest was a sign his lung had been punctured. Our veterinarian had to inflate Ernie's lung. She cleaned his wound and inserted a drain. The operation lasted serveral hours. "This cat has definitely used up one of his nine lives," Dr. Heather Bowles told us. "It is a miracle he is still alive." This is a story that cried out for mercy. Thanks to our loving help, our grateful patient made a full recovery. With each passing day, kindness is helping erase Ernie's haunting, sad memories. This lovable Husky endured two leg fractures. Her suffering meant nothing to a back-yard breeder. Back-yard breeders are responsible for some of the worst cruelty cases. Their animals live in unbelievable filth. The females are kept for as long as they produce litters and make money. Pup Pup was not allowed to exercise or stretch her legs. In confinement, her legs stiffened. Her muscles weakened. Under these conditions, it was impossible for Pup Pup to learn normal motor skills. When we brought her into our shelter, she could not stand. At fours years of age, she has had to learn how to walk. Lacy needed an operation - all because the same back-yard breeder who neglected Pup Pup also ignored the two breaks in Lacy's leg. Lacy pitifully dragged her leg, scraping it sore. An amputation, sad as it is, was the only thing that would relieve her chronic pain. Cruelty wins - only when caring people look the other way. Both Lacy and Pup Pup made a full recovery and were adopted to wonderful families! Pup Pup (left) is so grateful that we came to her rescue. She has made many new doggie friends, including Cassie! DOGFIGHTING: Tragically, some dogs are bred and trained to fight. Small animals like bunnies and kittens are used to develop the dogs' blood lust. George narrowly escaped being "bait". Imagine his terror as the sound of vicious barking signaled a brutal end to his life. George was adopted to a wonderful home! Newman thanks you for saving his life! 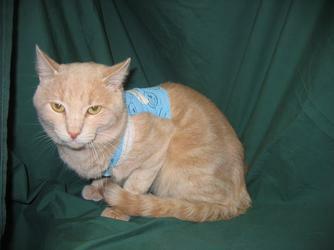 A cruel person abandoned this seven-year-old cat on the side of the road. Newman was missing a leg. He had a wounded ear and an abrasion on his face. We could picture him rubbing his head on the concrete and scraping his skin raw. It was a futile attempt to calm the intense itching caused by ear mites. Through it all, Newman never gave up the hope that someone would show him mercy. He was recovered from his ordeal and is happy in a new home.